Deep South Golf Cars opened its doors on October 25, 2005 with the goal of providing the best customer service in our industry. Ask around the camp ground, jobsite or hunting camp and you’ll find we have succeeded! At Deep South Golf Cars, customer service is job one! Deep South Golf Cars is a factory authorized E-Z-GO and Bad Boy Buggie sales and service dealer. We stock a large inventory of accessories and more important, oem parts. Those cheap parts can get expensive fast when they fail prematurely! Always ask for quality oem parts! Because of our large parts inventory and the high quality technicians we employ, we are able to return most repair jobs the next business day! At Deep South Golf Cars, we aren’t selling E-Z-GO and the newly designed Bad Boy Buggies by accident. We believe in standing behind the products we sell, second best is not an option. 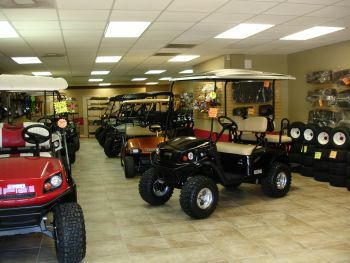 Come by Deep South Golf cars and you’ll see a large inventory of new E-Z-GO, Bad Boy Buggie, custom and pre-owned carts in stock in our newly renovated indoor showroom! We aren’t one of those dealers advertising to meet anybody’s prices. We have the prices those other guys are hoping you don’t see! At Deep South Golf Cars you’ll get the best customer service before and AFTER the sale, customer appreciation incentives, and a great price! Come see us in Metairie on Hickory Avenue, just south of Airline Hwy @ David Drive. WHATS YOUR TAKE ON THIS ONE?? EVER SEEN A WIDGEON WITH A RING ON ITS NECK?? Has anyone else tried the Anchor sight from Archery Innovations? If so, what do you think about it? Here's a pic of one of my trophies. It was my biggest bow buck to date 2 years ago, and not a whole lot smaller than my biggest to date now, a 7 point I stuck this past October. NO SHAME HERE!!! I'm mighty PROUD of him!!!!!!!! Can someone tell me the actual difference between the G2 contender and the Encore. I see both can be used as pistol, rifle, or muzzleloader. Is one better than the other, are barrels and accessories more readily available for one than the other? It seems the barrels may be interchangable from one to the other, are the stocks also interchangable? I have a 17'x 50" Tim's flat w/ a 23hp longtail Go-Devil that runs around 18 mph. I no longer duck hunt, and am going to start fishing again. I want more speed, but still want the low water advantages of a mud motor for rabbit hunting, bow fishing, frogging, etc. I'm told that stepping up to a surface drive is the answer to my problem. My question is for the guys who know surface drives, what hp would I need to get speeds of around 25-30mph from my boat with a moderate load, say two guys and an ice chest. I'm not real concerned with reverse, and I know there are quite a few companies selling surface drives, is any one brand standing out in the crowd??? Any information is appreciated. I took a trip with a friend and my son this morning with Capt. Eric Dumas. Conditions were rough, with south west winds picking up as the day progressed, and no shortage of boats out today. I can't say enough about our guide Eric! If you have ever shared a boat with Eric, you know what I mean when I say he is truely commited to putting his customers on fish! We ran south, north, and south again, burning fuel was never an issue.....he was determined to put us on fish at all cost! His efforts paid off, we picked up a few fish here and there, and caught more than most of the anglers we spoke to. We ended the day around 3pm, when just about all the other boats had given up hours before, Capt. Eric was willing to stay and see what the evening bite might bring us!! Due to family obligations we had to decline, but what a generous offer!! I had never met Eric before today, but after just a short time I felt I had know him for years. We had a great time, caught a nice mess of specks and one flounder, and picked up some great fishing tips from one of the best in the business! Thanks for a Great trip Eric, the fish were only a bonus! Hey guys. I have seen a few posts here lately about handgun hunting. I see lots of interest in the .44 mag, some mention of the .41 mag,.480 and .460, and a few rifle calibers for the encores. How about the .357, it seems to be a pretty flat shooter, a bit lighter on recoil, and I would think more than enough gun for whitetails. Why does it seem to be ignored?? We have a 2007 36v E-Z-GO TXT golf cart for sale. It have new 2019 US brand batteries, new battery rack, new body and newly recovered seats. 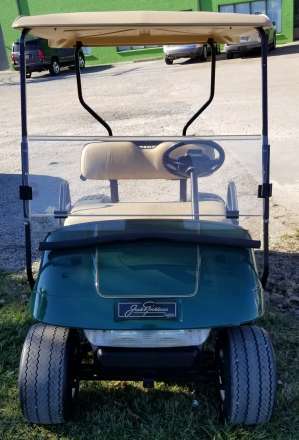 This cart is in great condition and looks and drives like new! Can be seen in Metairie at Deep South Golf Cars, $2850.00, cash sale only. Call Tim @ 504-737-0646.